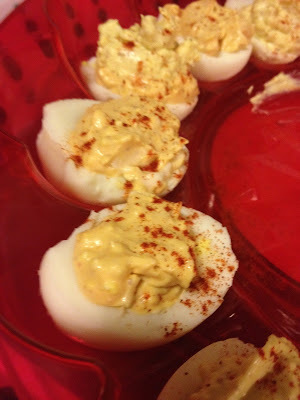 Deviled eggs are a favorite of my hubby. As I am in the kitchen making them, he circles around like my kids do when I'm making cupcakes. The other night, I told him that if he'd put some on to boil and then peel them I would make him a few different flavors. Let me also insert here that I know they do not look pretty. My deviled eggs never do. It takes an almost an hour to make them from start to finish. It take less than four minutes for my husband and sons to inhale them. Therefore, I've determined that it's not worth the extra work of piping in the filling and working on a beautiful presentation. I'd be lucky to get a photo before they were gone. Slice in half, longways. Scoop out yolk and place in large bowl. Repeat with each egg. Add about 1 1/2 cups mayonnaise. This amount will vary a little depending on how creamy you like yours and how big the yolks are. Add about two or three teaspoons of spicy mustard. I love to use the mustard I pick up at Drier's Meat Market in Three Oaks, Michigan when we are up there. It's delicious! You can get it online, too, at driers.com. So, I stopped there and filled about 6 of the egg halves. I scooped out almost half the filling, moved it to a different bowl and then added about 3 teaspoons of horseradish, stirred it well and added it to about 8 of the egg halves. Then I scooped out most of the yolk mixture that was left and added a couple teaspoons of sriracha sauce. I stirred it well and filled in the rest of the egg halves. With the little bit of original yolk mix that was left, I turned a few into double deckers with the sriracha mix on the bottom and the plain mix on the top. A Return to Noodles & Co.